I finally read the Hunger Games. I started reading it and then, three hours later, I was done. I read it because I love Woody Harrelson. When I heard that he was the drunken mentor in the HG movie, I was like, “I really want to see that.” Normally, I don’t particularly care about reading the book before I watch the movie, but in this case, I decided to. It was pretty enjoyable, but I’m not too sure about whether I’m going to read the next few books. (Hey, umm, some HG spoilers are gonna follow, so beware). The book is about a teenage girl who’s dispatched to fight to the death on television for the entertainment of an audience of jaded sybarites (in a futuristic dystopia, of course). It has hints of Rollerball, Battle Royale, The Running Man and “The Most Dangerous Game”. The only innovation of the novel is that the protagonist realizes that she needs to have the audience’s good will in order to survive. This is because the audience is able to dispatch gifts to help their chosen kid, and those gifts can (and do) mean the difference between winning and dying. However, because this contest has a sort of reality show flavor, what really matters is building some kind of credible storyline. A kid needs to feel like flesh and blood; someone the audience can empathize with and root for. 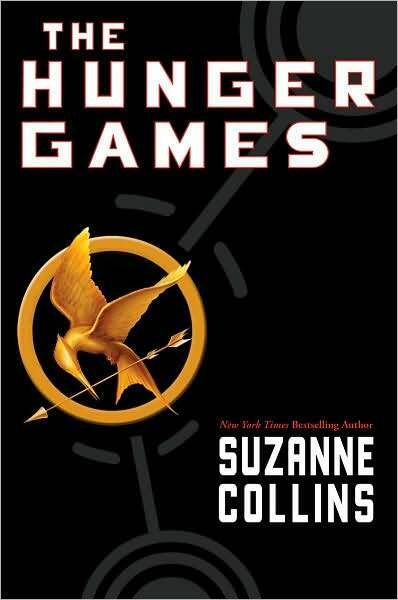 In order to this, the protagonist of the Hunger Games (whose name is Katniss) fakes that she is falling in love with one of her fellow contestants Peeta. While she’s running around killing other kids in a series of moderately gripping action sequences, she also learns how to inhabit her role as a starstruck lover (which is made much more poignant by the fact that she might possibly have to kill her ‘lover’ in order to win the game). I thought this was a neat conceit. It sort of came out of nowhere about a third of the way into the book, and it slowly grew to dominate the whole story. This whole reality show / playacting part of the story was by far its best part. And I don’t really trust any of the other novels to have good parts that are as good. I mean, the author can’t use this reality show conceit again, right? And even if she did, it wouldn’t really be fresh. I don’t know why I am so suspicious of a series whose first entry I enjoyed so much, but I think what it comes down to is that I just don’t trust Suzanne Collins enough. Pretty much every series starts out with a few good ideas and then slowly exhausts them until eventually the later books of the series turn into pitiful self-parodies. When a series starts out with one good idea, it becomes really hard for me to believe that there is a lot more stuff lying underneath. On a side note, my problems with the book were exactly the same as everyone else’s problems. Collins manipulates the situations in this book to exculpate her heroine of any of the moral guilt from killing a bunch of other kids. The other kids are either psychopaths or they get killed by the psychopaths. Katniss’ hands remain clean. To me, that seems like a waste. If you have a book where innocent kids are forced fight each other to the death…then some innocent kids ought to actually fight each other to the death! As a writer, I do kind of understand why Collins did that, though. The audience for stories with moral complexity is a lot smaller than the audience for stories without moral complexity. Even a lot of the series that people claim have a lot of moral complexity are actually just standard Good-and-Evil narratives dressed up in gray clothing. A prime example of this is A Song Of Ice And Fire. People claim that this series is very dark and gritty, but actually, from book one, you know who the heroes are and who the villains are. Sure, some of the villains turn out to be likeable and some of the heroes turn out to be stupid, but very little occurs to make you question the original good/bad classifications. Even in my own stories, I sometimes step back and am like, “Whoah, no one is going to like this main character” and then I change around some stuff to make him/her more likeable. Because that’s what people want. I thought of [F. Scott Fitzgerald] as a much older writer. I thought he wrote Saturday Evening Post stories that had been readable three years before, but I never thought of him as a serious writer. He had told me at the Closerie des Lilas how he wrote what he thought were good stories, and which really were good stories for the Post, and then changed them for submission, knowing exactly how he must make the twists that made them into saleable magazine stories. I had been shocked at this and I said I thought it was whoring. When I read this passage, I was shocked. Since Fitzgerald’s stories are pretty sublime, I wondered what in hell it was that he was changing in them? I had a sneaking suspicion that maybe if I read the unchanged stories, I wouldn’t like them very much. That is a sad reality, but understandable one. If the works aren’t very popular and the author wouldn’t allow them to be altered, there is always years after they die to become popular if not labeled visionary. But in Fitzgerald’s case, it’s the altered works that have become popular and been deemed visionary.